Whippet madness and a bit of Rocky Road! I have had a lovely day to today! It is Bank Holiday Monday over here in the UK which usually means that it will be chucking it down all day and that traffic will be murder! Not generally a good day to step over your doorstep but today I have been pleasantly surprised. The weather hasn’t been too bad and when I did venture out, the traffic was moving and didn’t appear to have the usually amount of crazies in it. 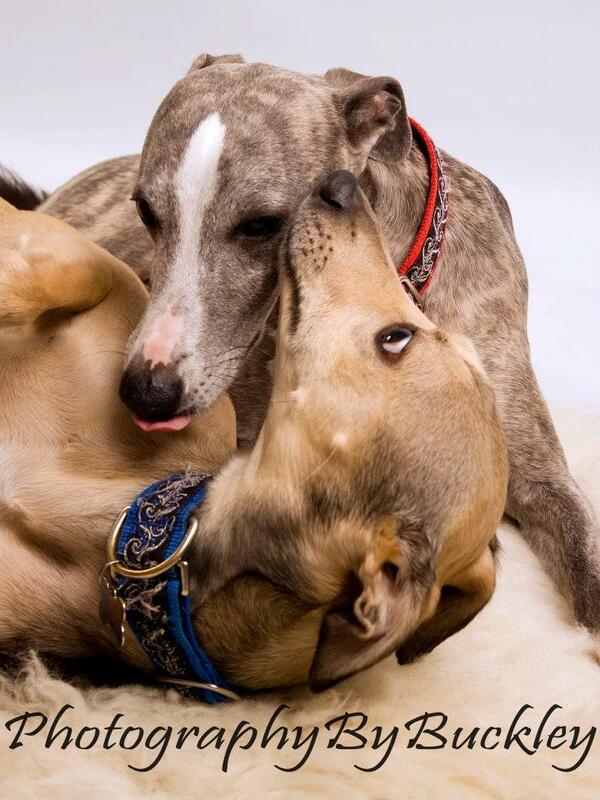 The reason for my bravery was that I needed to take my whippets to have their photos taken professionally. As all whippet owners will tell you, getting a decent picture of your pooch is nigh on impossible. I have plenty of photographs of tails. I have some lovely close-ups of noses too. I even have a sky shot due to being knocked flat on my back by an over enthusiastic greeting! Most of my “good” pictures were taken when they were crashed out following a walk. Having bumped into Susan Buckley in my local pet store, I knew that this was the woman to help me get that “all facing the same way: in focus: 3 dogs in a row” shot. Well in truth, we didn’t quiet manage it! Hector was an absolute star, bless him, and posed perfectly on cue! Ash, my blonde bombshell insisted on being in every shot even when he wasn’t meant to be and Felix, my little blue boy, became a testosterone fuelled demon whose only interest was finding a way to open the back door so that he could go and “introduce” himself to Sue’s female dogs outside. What is it they say? Never work with animals and children! Well, Sue does both and she is brilliant at it. The following image is one that she took today. She has kindly allowed me to use it here in this blog but I must stress this image is the property of Photography By Buckley* so please do not reuse it. I cannot tell you how over the moon I am with the photographs Sue has produced. Ok, so we didn’t get them all together in the same shot and, yes, I am probably going to have to remortgage my house to pay for all the photos (Sue is NOT expensive; I am just spoilt for choice!) but to be honest, I simply don’t care! I love my whippets and I’m not afraid to say it! The “cherry on the cake” of my lovely day was (brace yourself, here is the tenuous link) coming home to find that my Rocky Road had set whilst we were out. Ok, I’ll come clean, I’m only including the recipe because I felt guilty about waxing lyrical about my whippets on what is supposed to be a food blog! 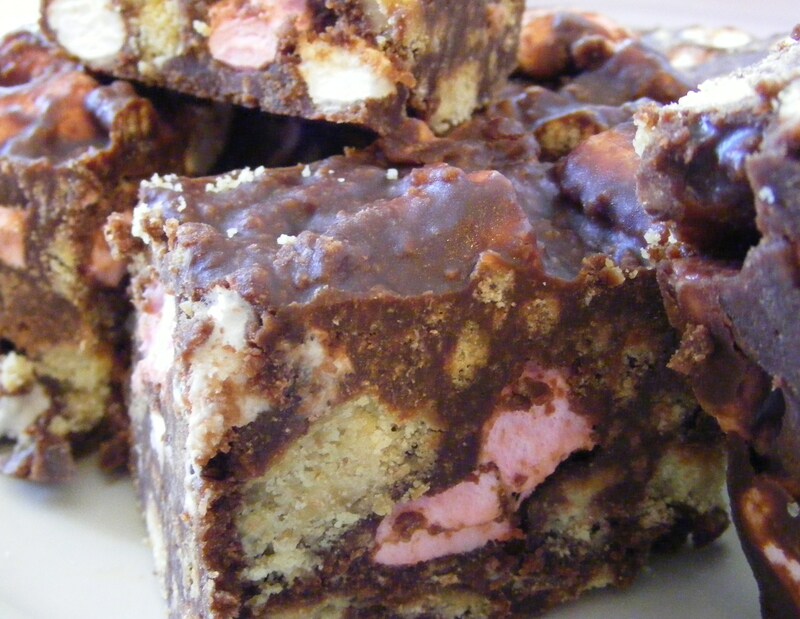 It is good Rocky Road though! Melt the butter, chocolate and syrup together in a heavy bottomed saucepan and stir together. Bash the biscuits into small pieces in a plastic bag. This is brilliant if you are a tad stressed! Mix the biscuit into the chocolate mixture. Tip into a lined 8 inch square cake tin and refrigerate until set. Rocky Road is so versatile that I often throw in cherries and raisins or I alter the biscuit I use. * Photography By Buckley can be contacted via Facebook or ask me for contact details.